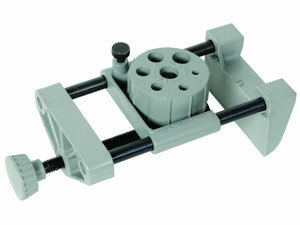 JointMate Is A Universal Dowel Jig For Quickly And Accurately Creating Corner, Edge And Surface Joints With Ease. 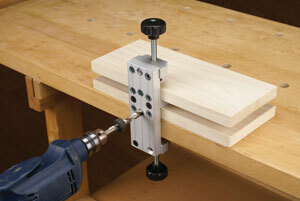 Perform one-handed alignment and skip the hassle of measuring and marking when drilling corner or edge joints. 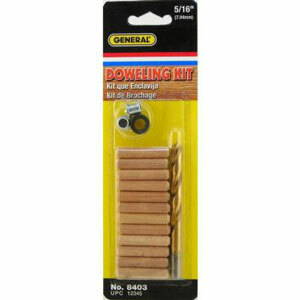 General Tools doweling jig is a precision jig that assures the accurate line up of dowel holes in furniture and carpentry. Simply clamp the jig onto your work piece to quickly drill accurate holes for dowels pins, requiring exact alignment in the edge, end or surface of your work. A step by step booklet is included! Heavy duty aluminum jig effectively simplifies the doweling process, allowing you to create Edge to Edge, Right Angle and Edge to Surface joints with little effort. 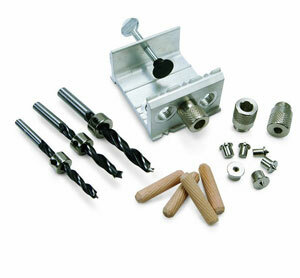 Applications: Use with 1/4", 5/16" and 3/8" Joint Sizes. Ideal for 5/8", 3/4" and 1" Stock. 1 ea. Brad Point Drill Bit - 1/4"
1 ea. Brad Point Drill Bit - 5/16"
1 ea. Brad Point Drill Bit - 3/8"
1 ea. Drill Stop - 1/4"
1 ea. Drill Stops - 5/16"
1 ea. Drill Stops - 3/8"
1 ea. 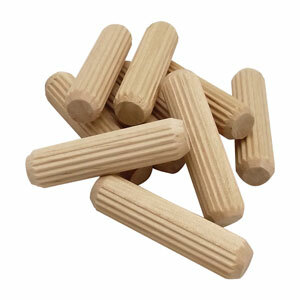 Drill Bushings - 1/4"
1 ea. Drill Bushings - 5/16"
1 ea. 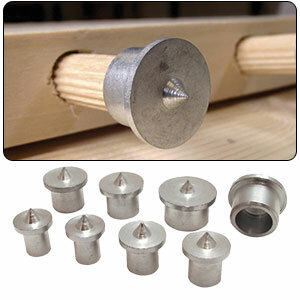 Drill Bushings - 3/8"
2 ea. 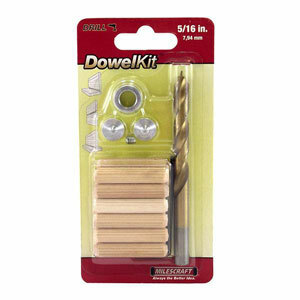 Dowel Center Points - 1/4"
2 ea. 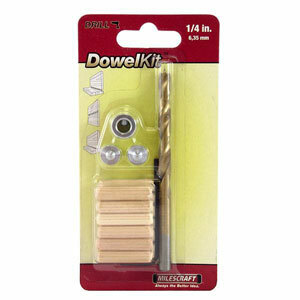 Dowel Center Points - 5/16"
2 ea. 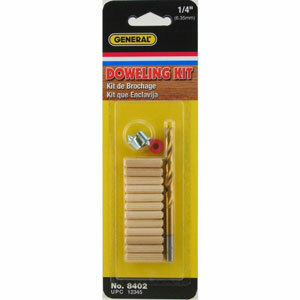 Dowel Center Points - 3/8"
Despite the rumors to the contrary, Doweling is not dead! Joints made with glued hardwood dowels are stronger than biscuit or pocket hole joinery. Our aluminum dowel jig gives you the precision demanded by professional and novice woodworkers alike. The unique clamping system allows you to dowel panels or right angles. Precisely aligned guides for 1/4'', 5/16'' and 3/8'' holes. 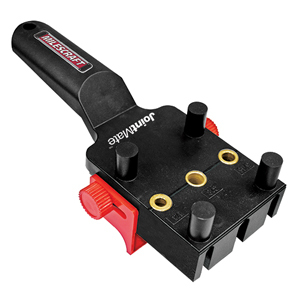 This jig handles stock from 1/2'' to 1-1/4'' and can be used to join stock edge to edge and end grain to side grain for 90 degree joint like face frames. 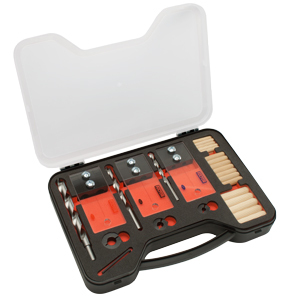 Includes precise depth stops for 1/4'' , 5/16'' and 3/8'' drill bits and an assortment of dowels. 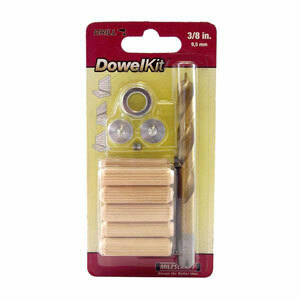 This set has all the components to get you started making quick and simple dowel joints. The Fulton Doweling Jig are perfect for wood workers who want a quick, strong joint without a lot of the annoying process. Many dowel jigs make you mark on the inside edge of the joint, which means you have to transfer marks from the face of your stock to the edge, or even measure and mark with a tape measure. These dowel jigs are transparent, which means layout is much easier. Set the two pieces of stock together and mark a line across the center point of your center joint. the see thru reference lines allows you to line up the jig perfectly. Clamp the jig in place and drill. Accurately mark location of dowel holes or existing pins location in second board being joined. Multiple Groove Dowel Pins allow excess glue and air to escape for more uniform glue dispersion and a stronger joint. Provides a quick and accurate method of transferring dowel hole locations from one wood piece to another.